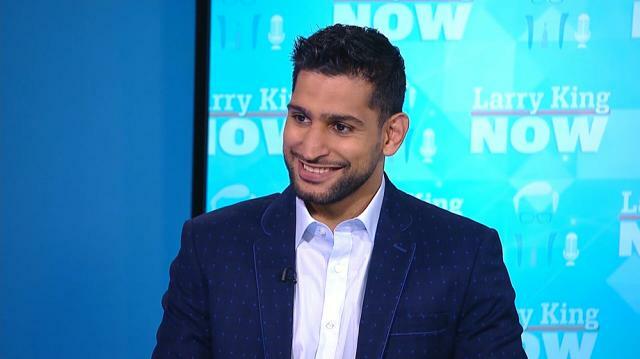 From London, Larry welcomes British boxing great Amir Khan to discuss his future fight prospects and the forthcoming Mayweather versus McGegor bout. Plus, the former WBA champion delves into politics, talking Trump and Obama, as well as the perception of Muslims in current Western society. Larry sits down with two-time World Champion British boxer Amir ‘King’ Khan in London. The world’s youngest Olympic boxer covers Islam, boxing, and his charity ‘The Amir Khan Foundation’. Khan is expected to re-enter the ring this year since his last fight in 2016, and has been out due to surgery on a hand injury. For 10 years, the boxer has been fighting with hand pain and splints. In this in-depth interview, Amir shares family details on his Pakistani upbringing, childhood boxing lessons, and about his influence on Pakistani sports fans. As a Welterweight fighter, Amir expresses that gaining weight affects his fighting style, and is happy to stay how he is. Larry and Khan also discuss Amir’s encounter with meeting his childhood icon, Muhammad Ali, and Khan reveals how he got to represent Great Britain in the Olympics. Amir also expresses a longing and regret of not coming to America as a teen fighter in order to become a “Global Star”. Larry and Amir debate the outcome of the upcoming Floyd Mayweather vs. Conor McGregor fight. While Larry sees a slight possibility of Conor gaining the upperhand, Khan believes that Floyd will win with as much ease as an easy walk in the park. Amir shares the story of how he was branded with the name ‘King Khan’, and hopes to be back in the ring in October or November. Larry brings up if Amir will be fighting Manny Pacquiao any time soon. Khan concedes that it is a possibility, as well as the possibility of fighting in Dubai, the UK, and returning to Vegas. He also shares that he would love to fight Pacquiao, with whom he attended past training. While Amir is a skilled fighter, he is also a devout Muslim, and expresses his sadness at the recent terror attacks in Britain, as well as defending Muslims around the world. The subject of fasting for Ramadan leads Larry to ask Amir on his views on Trump’s travel ban. Khan provides a diplomatic response, and believes that all communities, Muslim or not, should unite together. Amir is determined to make a change through his charity, ‘The Amir Khan Foundation’, and expresses his wish to see a world that lacks religious hate for his daughter to grow up in. Larry ends the the conversation on a lighter note with a round of ‘If You Only Knew’, and Amir responds to fan questions on Twitter.